Your big day is approaching, and you want it to be successful and everyone that gets that invite has to enjoy and celebrate it as the wedding of the year. The most important thing that people enjoy on a wedding is food. Yes, food! Therefore, in whatever way, you have to choose what will make everyone happy on your buffet wedding menu. Making the decision whether to serve your guests a plated dinner or a buffet can sometimes prove to be tricky. One is torn between two choices that are almost equally as awesome. Plated dinner has an advantage of all the guests getting their food at the same time. In addition, table service will give the guests a chance to have conversations. More importantly, it does away with the need to move around tables with plates and glasses. However, a plated wedding would not be appropriate if you want a casual-like wedding. On the other hand, a buffet is considered cost-effective as it requires less staff. If you were on a tight budget, this would be the best choice for you. In addition, guests are offered a variety of food selections not to mention that guests with allergies to some food can choose from many options. Needless to say, the buffet line is a great place for your guests to interact. While the two options seem equally as good, a buffet wedding is the best choice for you if you want it to be cost-effective, and if you want your guests to interact. 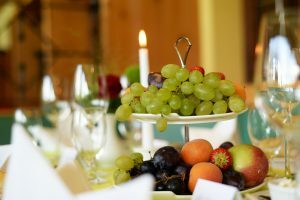 With your desires in mind, here are some great ideas that you can look into while creating a perfect wedding buffet menu. Light servings will make the diners feel ready to have another round in a buffet. Of course, you can serve meat, but make sure to include fresh and crisp options. You also cannot forget to include salad options to add some textual intrigue such as crushed nuts and raw vegetables. Make sure that you do all the work in advance to avoid giving the diners extra work, which would be unnecessary. For example, you can slice a savory cauliflower cake into tiny slices, in advance. This means that the diners only have to take a piece from the platter to their plate. Also, ensure that you have available all the small appliances and kitchengearpros.com helps to give you a good suggestion on it. It saves on time as the time the diners could have used to cut the cakes is eliminated and keeping the buffet line relatively shorter. When food is involved, guests like moving in packs. They walk and stand without watching how close they are to the tables. To avoid this, it would be proper to give the buffet line a starting point and an ending point, leaving extra space at both ends. A trick that always works is putting the drinks table at the far end, separate from the food table. At a buffet, diners have a lot to shuffle, from drinks, their food, and endless conversations. It would be unfair to the diners to make it more difficult for them with many plates and bowls. While people love soup and some stew, it is only suitable for a sit-down dinner. Avoid food that is so saucy that it trickles off a plate. Here is a vital rule at the food table: do not make diners pick spoons, knives, cups or forks at the beginning of the table. Only plates should be at the beginning of the line. 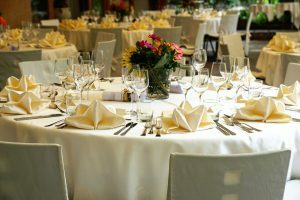 Better yet, cutlery can be placed on the tables where the guests will sit and eat. When there are too many good foods to eat, your guests will most likely be tempted to consume more than usual. To avoid having a crazy night, red or white wine would be preferred. Hard alcohol may present you with a night you would not want to remember. Again, remember people go through a line as a herd. Creating a number of points of access for everything is an excellent idea. Instead of putting one stack of napkins, putting three, which are slightly staggered, is better. Putting stacks of plates at the beginning and the end of the table gives people a chance to wander from any direction. Without a doubt, buffet weddings are the best option. They are considered the most casual wedding meal style. 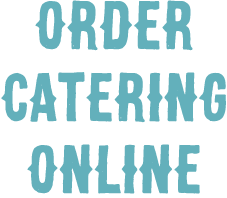 It offers a variety of dishes and options, making it the most versatile wedding meal option. When you want to cut costs while giving your guests an opportunity to serve themselves with the meals they like best, buffet weddings are your best choice. Not to forget the wonderful experience guests are likely to have as they interact. Good luck with planning your buffet wedding!